Rovers had a rough time again at auction today, and in particular two Streetwise. This 4k mile 2004/54 1.4S 103PS bid to a mere £3,950, while another similar car, just 2k miles but on an 04 plate bid to £3,800. 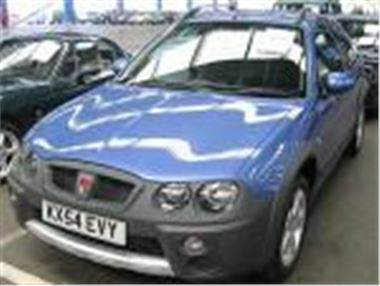 A 58k mile 02 reg MG ZS 120PS bid to £1,950 and a latest facelift 10k mile 2004/54 MG ZT 120PS with a/c and 17” alloys bid to £7,600. Yet a 30k mile 2002/52 MG ZR 120PS with a/c sold for £4,000, a 32k mile 02 reg MG ZR 103PS with sunroof sold for £3,350, a 6k mile 2004/54 MG ZS 120+ with a/c bid to £5,900, a 4k mile 2004/54 Rover 25 2.0TD 101PS bid to £6,300 and a 21k mile 02 reg MGTF 135PS sold for a respectable £6,450. A 10k mile 2003/52 reg Mazda MX5 1.8 Montana with leather, a/c and hardtop sold for £11,000, while a 22k mile 2003/53 reg base MX5 1.8 with steel wheels sold for £8,700. Reasonable buys included a 71k mile 02 reg BMW 318iSE 2.0 143PS Touring, sold for £8,500, a very clean 122k mile 2000X BMW 530dSE auto, sold for £7,700, a 42k mile 02 reg Mondeo TDCI 130 Ghia, sold for £5,900 and a 77k mile 2000X Golf GTI 1.8T sold for £5,450. On the dear side, a 72k mile 02 reg Volvo S60 D5 SE made £8,000, a 94k 2001/51 SEAT Leon TDI 110SE sold for £4,550, a 107k mile 2001/51 Mondeo 1.0 Zetec sold for £2,600 and a 12k mile 2004/54 reg Passat TDI PD 100 Highline sold for £13,025. Cheap cheapies included a 159k 89F Volvo 240 2.3GLT sold for £140, a 45k mile 89G Nova 1.2L 3-dr sold for £80 and an unwarranted mile 93L Cavalier 1.8iLS with no keys sold for £20. There will be a big Ford ex-rental sale open to everyone tomorrow, 21st June. Entries included 86 Focus, 20 C-Max, 37 Mondeos, 5 Fiestas, 7 Galaxys and 4 Fusions. The Mondeos include a TDCI 130 auto estate and an ST 220. Look out for the Blackbushe ‘Van 200’ next Saturday 25th June at 10.30am with 100 entries from Royal Mail, 35 from BT, 30 from LEX and 25 Blackbushe Select dealer stock.